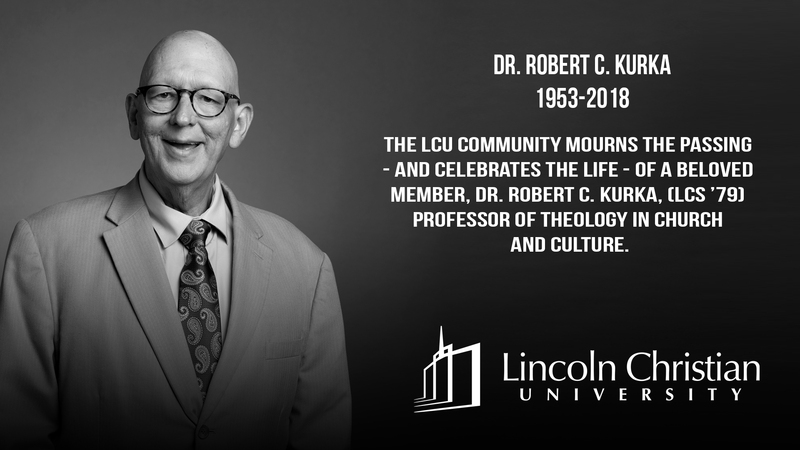 The LCU community mourns the passing – and celebrates the life – of a beloved member, Dr. Robert C. Kurka, (LCS ’79) Professor of Theology in Church and Culture. Bob was a thoughtful, quiet listener and yet also a dynamic teacher and preacher. He had a brilliant mind that was analytical, yet he was also the consummate optimist. Good humor was a pervasive part of his character, and he was known for his perpetual smile, twinkling eyes, and his ability to make a joke using just his eyes. In the church, Bob was active as an elder for many years, a small group leader for even more, and a compassionate counselor to many in crisis. He was a dependable choir member and an accomplished violinist for church and community special events. Early in his ministry, Bob served as the preacher at Darlington Christian Church (IN), Christ Church in Germantown, IL, Germantown Christian Church in Metamora, IL, and DeKalb Christian Church (IL). Bob joined the faculty of St. Louis Christian College in 1985, where he taught New Testament and Theology until coming to Lincoln Christian University in 1992. In academia, Bob was a careful writer of pioneering articles, a chairman of regional meetings of the ETS, and an innovator in the new discipline of Bioethics. Both in churches and at conferences, he often gave workshops on missiology, apologetics, culture, and worldview perspectives. In his many lectures and articles, Bob boldly explored difficult theological topics: the nature of Allah from a Christian perspective, the concept of human free will and of the will of God (open theism), the understanding of the Holy Spirit in the Restoration Movement, the inerrancy of Scripture, theistic evolution, and our understanding of Adam and Eve. Bob’s teaching lacked walls. Though he often taught in a classroom, he also taught on the sidewalk, in the cafeteria, and in coffee shops. He taught as the leader of spiritual formation groups and restoration week trips, and he taught wherever he was given an opportunity to do so – from Nebraska to China. If you were Bob’s student, you were Bob’s student for life, and he served as a resource and encourager for countless students right up to his passing. All of that said, the one thing Bob treasured most was his family: his wife Bev, daughters Lara, Amber, and Holly, and fourteen grandchildren. Many others were invited into his extended family, his students, his colleagues, his church – Bob never met anyone he couldn’t love.